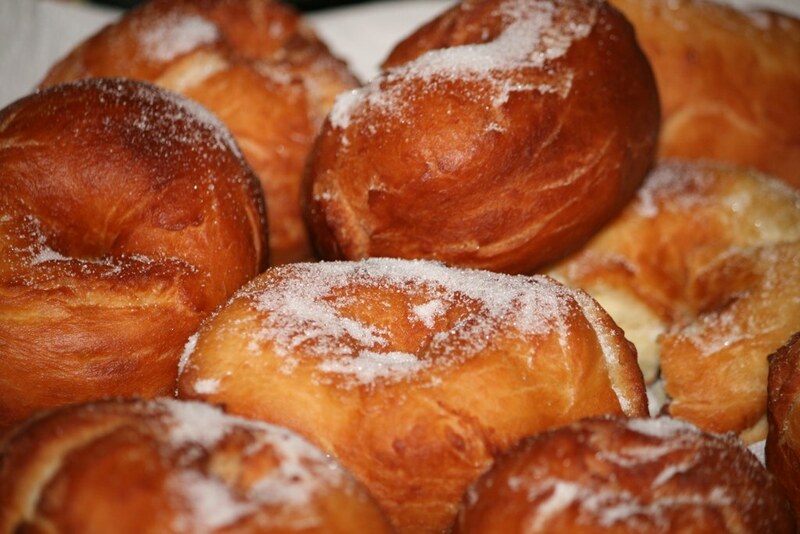 Catholic Cuisine: A Shrove Tuesday Treat: Filhoses! A Shrove Tuesday Treat: Filhoses! 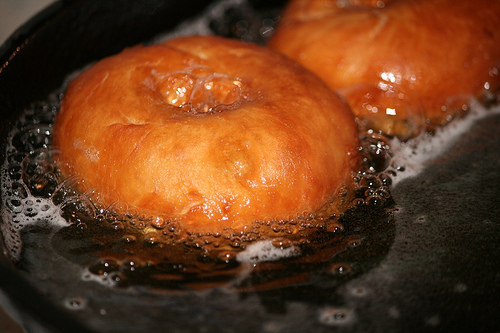 A Mardi Gras tradition in our house is Portuguese donuts! 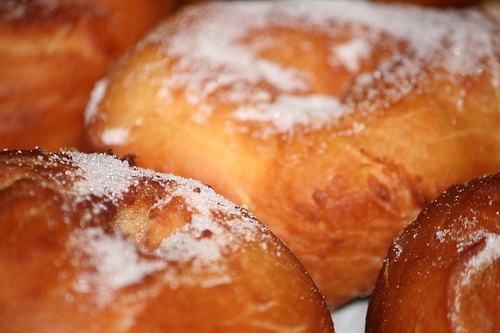 It is very similar to Portuguese sweet bread but this dough is, of course, deep fried and sprinkled with copious amounts of sugar. The recipe can be found in Foods of the Azores Islands by Deolinda Maria Avila. There are many great recipes in this book, though it is hard to find. Beat eggs, add sugar, butter, yeast dissolved in water, whiskey, lemon rind and salt. Beat till light and add flour, kneading until smooth. Cover dough with cloth and let rise till double in bulk. Heat oil in a deep pan (I use my cast iron pan), keeping heat at about medium. Take about 1/3 cup of dough and stretch it into an oval shape, piercing the middle. Carefully, drop the dough into oil till golden, turning only once. Remove from oil and cool on paper towels. Serve warm sprinkled with sugar… and maybe bowl of sugar to dip them in too!!! These look delicious! I have to admit, I giggled seeing that sweet young man hugging the Jack Daniels :-) Ah, the innocence of youth :-) I can't wait to give these a try. Thank you for sharing. I am so tempted to make these right now! The photo with your son is just adorable! Oh, who can resist donuts? -- one last splurge before Lent! Thanks for sharing. These look so yummy, thanks for the great recipe and the chuckle ;-) A blessed Lent to you all at Catholic Cusine! Wouldn't this be a basic recipe for beignets?